What Day Of The Week Is August 26? 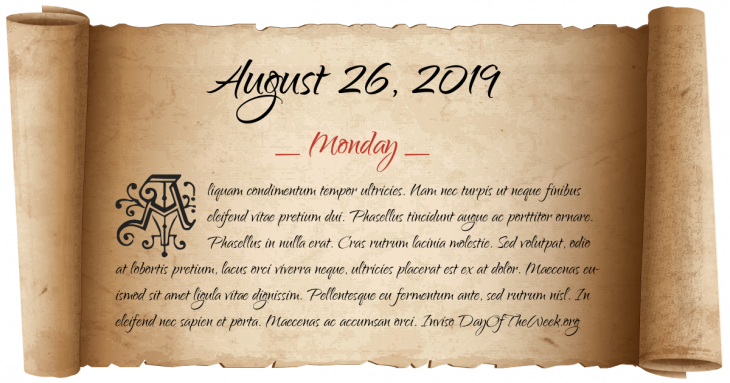 August 26, 2019 is the 238th day of the year 2019 in the Gregorian calendar. There are 127 days remaining until the end of the year. The day of the week is Monday. Roman forces under Julius Caesar invade Great Britain. Joan of Arc makes a triumphant entry into Paris. The former viceroy Santiago de Liniers is executed after the defeat of his counter-revolution. World War I: the German colony of Togoland is invaded by French and British forces, who take it after 5 days. Chad becomes the first French colony to join the Allies under the administration of Félix Éboué, France’s first black colonial governor. The then new feminist movement, led by Betty Friedan, leads a nation-wide Women’s Strike for Equality. Who were born on August 26?